The Mega Mover These lightweight folding hand trucks fold up to fit into small storage spaces. The Mega Mover hand truck is made of aluminum, has a 25” nose plate for moving large loads, and is nearly 4-feet tall. It has 8” pneumatic tires that can withstand the bumpiest of paths, and will not leave marks on the floors of your home. 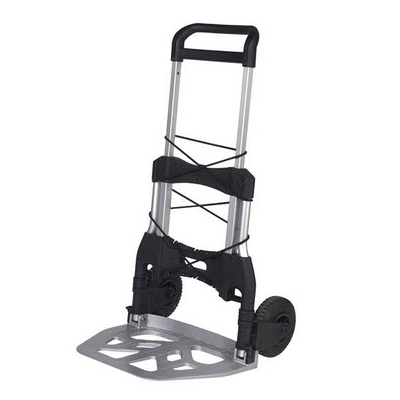 When you fold up this lightweight hand truck, it goes from over 2 feet wide to just under 5” wide. You will be able to fit it in a space as small as a car trunk—with enough room left over to store at least ten more. It comes with elastic straps to secure loads—and it can carry up to 550lbs. This folding hand truck is definitely a big payoff in a little package! 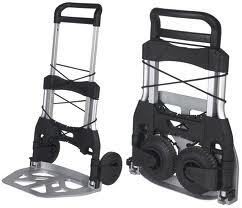 Need replacement tires for this hand truck? Click here. Check out the Wesco Mini Mover folding hand truck. See other folding hand trucks here. Extended demensions 47" x 26.5" x 25.5"
Folded demensions 34" x 23.5" x 4.75"